Australian skipper Tim Paine says Matthew Wade and Jackson Bird have stormed into Ashes contention against a wobbly England unit with talk of their Test demise 'premature'. And, the West Indies' 2-1 Test series triumph against England in the Caribbean this month has bolstered Australia's spirits with Paine elated to welcome back Steve Smith and David Warner when fit. Tigers captain Wade (663 runs at 60) led the Sheffield Shield run tally all season before overtaken by Test opener Marcus Harris (670) this round. Paine noted his own reinvention as Test skipper and keeper proved Wade "absolutely" had a Test future. "I think he does He is the same as Jackson, someone who thought his time was up and I know better than anyone, I have been in that situation so you have to keep plugging away, scoring runs and when opportunities pop up you have to be ready to take it," said Paine, who replaced Wade as Test custodian. Wade promoted himself to No.4 and made 77 against the Redbacks on Sunday but for 'the good of the team' and not to appease national selectors who told him to bat higher for Tasmania. Former national selector Mark Waugh argues Wade can't be seriously considered as a Test No.4 or No.5 batsman. "Both Matt and Jackson if an opportunity came up - and they are both in really good form - are ready to play Test cricket," noted Paine. Tasmanian seamer Bird (7/59) leads the Shield wicket tally with 38 at 19 after his fifth, 10 wicket match haul against South Australia in Adelaide. "He is doing really well and has been going really well for Tasmania for a number of years. 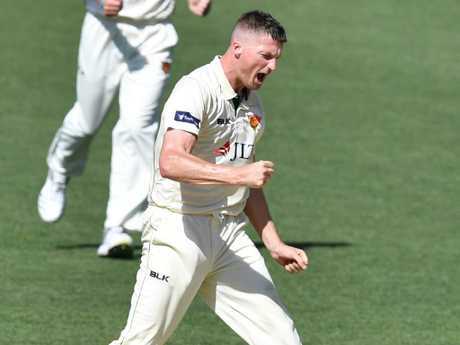 When Jackson bowls the right length with a Dukes ball he is an absolute nightmare, can swing the ball both ways and nip it around," said Paine following Tasmania's six wicket-win against SA in Adelaide. "If he keeps going like that I am sure he is right in the frame." Bird played the last of his nine Tests against England on Boxing Day at Melbourne in 2017 and lamented on Saturday his time in the baggy green had passed. Not so says Paine. "If he keeps bowling the way he is, conditions in England historically would suit a bowler like Jackson. I think he is a better bowler now," said Paine of Bird, stuck behind Pat Cummins, Josh Hazlewood, Mitch Starc and Jhye Richardson in the Test queue. Australia hasn't conquered England in the Old Dart since 2001 but Paine believes Australia will have the firepower to match a rival on the wane. "We know England, when they are playing well are an excellent team, but they have some holes in their armour. It would be silly to think we are not good enough to beat them," said Paine. "We are understand we have to play extremely well." Paine said he was in regular 'contact' with former Test captain Smith and opener Warner who are integral to Australia's success once over elbow injuries. "It's a good time to have them back," said Paine. Australia's Ashes preparations will feature games involving an Australia A side through July after which the squad to face England in the August 1 series opener at Edgbaston will be finalized.